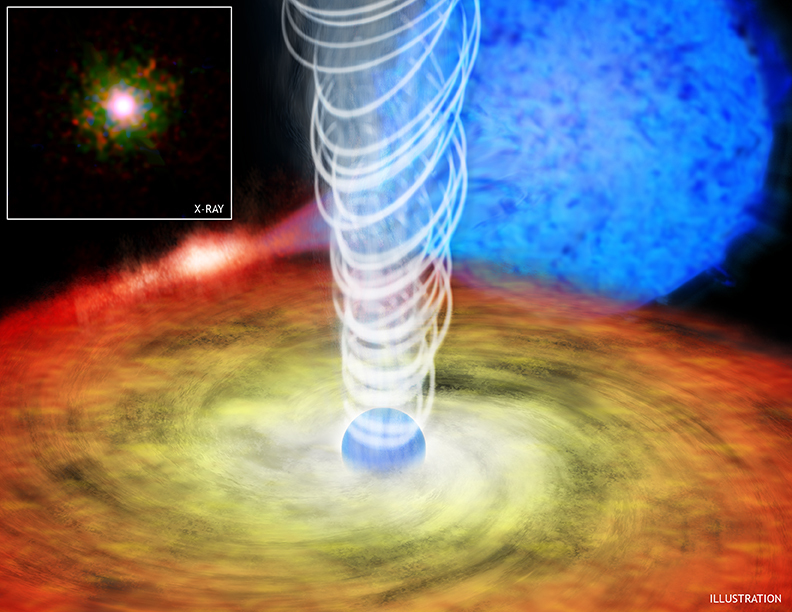 This artist's illustration depicts the jet of relativistic particles blasting out of Circinus X-1, a system where a neutron star is in orbit with a star several times the mass of the Sun. The neutron star, an extremely dense remnant of an exploded star consisting of tightly packed neutrons, is seen as the sphere at the center of the disk. The powerful gravity of the neutron star pulls material from the companion star (shown as the blue star in the background) into a so-called accretion disk surrounding it. Through a process that is not fully understood, a jet of material moving at nearly the speed of light is generated. A high percentage of the energy available from material falling toward the neutron star is converted into powering this jet. The image in the inset is Chandra's X-ray image of the neutron star in Circinus X-1. Low energy X-rays are shown in red, medium energy X-rays in green and high energies in blue. The jet itself is seen to the upper right corner and consists of two fingers of X-ray emission (shown in red) separated by about 30 degrees. These two fingers, located at least about 5 light years from the neutron star, may represent the outer walls of a wide jet. Alternatively, they may represent two separate, highly collimated jets produced at different times by a precessing neutron star. That is, the neutron star may wobble like a top as it spins and the jet fires at different angles at different times. The structures on the opposite side (red, to the lower left) may be evidence for counter jets. 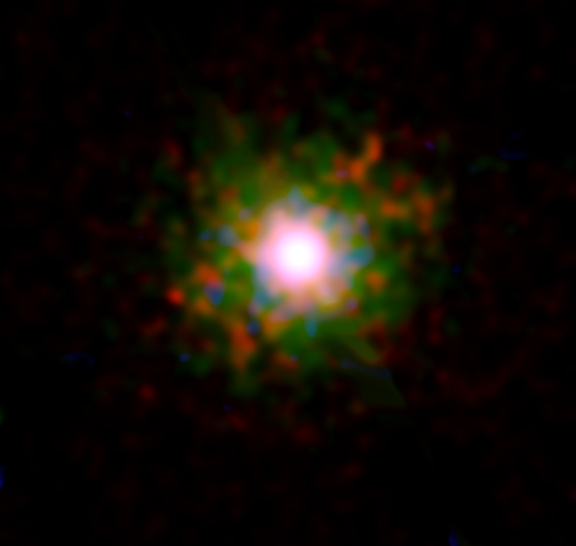 The rest of the colored areas surrounding the bright central source are instrumental artifacts and not representative of structures associated with Circinus X-1. The jet in Circinus X-1 is helping astronomers better understand how neutron stars, and not just black holes, can generate these powerful beams. Many jets have been found originating near black holes (both the supermassive and stellar-mass variety), but the Circinus X-1 jet is the first extended X-ray jet associated with a neutron star in a binary system. This detection shows that the unusual properties of black holes -- such as presence of an event horizon and the lack of an actual surface -- may not be required to form powerful jets. The result also reveals how efficient neutron stars can be as cosmic power factories.